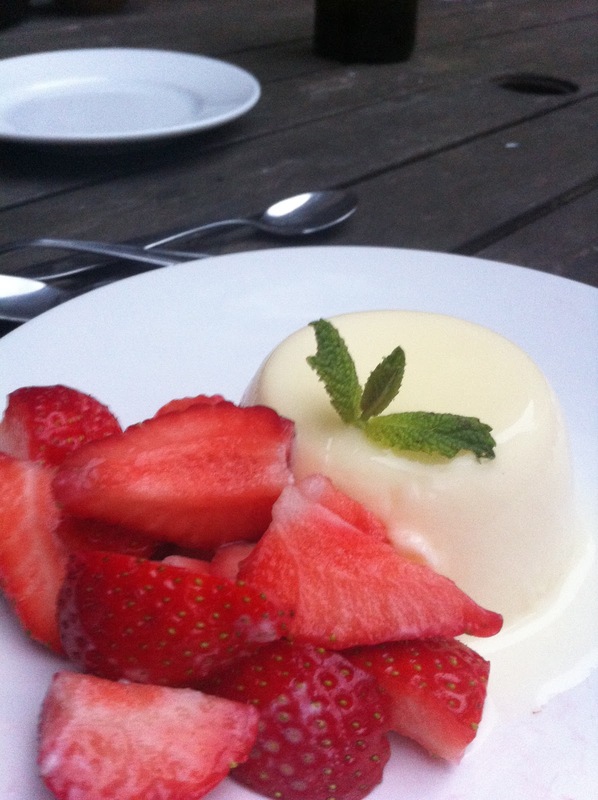 I love making pannacotta, it is a really great light summery pudding. I have been meaning to experiment with different flavours of pannacotta for a while. Last summer I made a rather good passion fruit one but forgot to take a photo of it so never bothered blogging about it. This months Floral inspired Tea Time Treats spurred me on to attempt an elderflower variety. This recipe worked very well but remember that it only tastes as good as the elderflower cordial so don't scrimp on it. The recipe also specifies 2oz caster sugar but I prefer my pannacotta not too sweet so I only used 1oz. Heat the milk and cream through gently but don't let boil. Add the sugar and stir until the sugar has dissolved. Soak the gelatine in warm water for a few minutes. Take the cream mixture off the heat and stir in the gelatine until it has completely melted. Add the elderflower cordial, stir and pour into six ramekins or moulds. Place in the fridge to set for a 3-4hrs it can easily be over night if you want to get ahead. To release from the moulds dip them into warm water for a few seconds or run a pallet knife around the edge. Serve with soft fruit. oh I love pannacotta...and..I have some elderflower cordial! this might just be on my make list! sounds lovely! I saw it on twitter and just had to come over to see it myself! my sister loves panna cotta, this is brilliant, I plan on getign some elderflower cordial home when I go back to Singapore in late summer, I'll try this then! This sounds delicious and one that I have to try considering 2 of my last 4 blog posts have been "Panna Cotta" and "Elderflower Cordial" :) I am going to have to try your recipe combining both together!